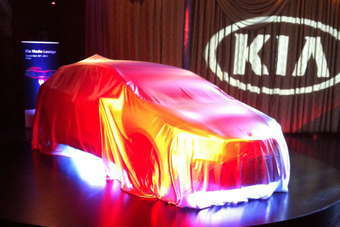 Kia has pulled the covers off its two new world premieres on the eve of the show. Who better to answer my questions about them than the company's head of design, Peter Schreyer? I'm just back from dinner with Kia Motors. Earlier, at another venue, there was a preview event where perhaps a hundred or so media were shown the new pro_cee'd and Carens. The pro_cee'd should not be thought of as a three-door cee'd but a sports coupe, the same approach Opel-Vauxhall takes with its Astra equivalents. Will the new model sell? Undoubtedly: Kia sold 55,000 of the first generation model over a five-year lifecycle, that number representing 12-14% of all cee'd model range sales in Europe. As for the Carens, it was pointed out that this segment, which Kia calls C-MPV, is almost 900,000 units per annum in Europe and the company wants a far larger slice of that total. I had a look over the new model, which will be available in five- and seven-seater format in EU markets. In some markets, it will again use the Rondo model name. I asked Peter Schreyer if we could think of the Carens as the cee'd MPV, and he didn't disagree with that description, so I think we now know what platform this VW Touran rival sits on. It goes on sale in the northern hemisphere Spring (Europe), as does the pro_cee'd. Remember the Kia GT concept from Frankfurt 2011? Will it make production? Schreyer says the project to build this rebodied Hyundai Genesis sedan awaits "the green light". When I suggested it could be in showrooms around 2015/2016, there was a smile.